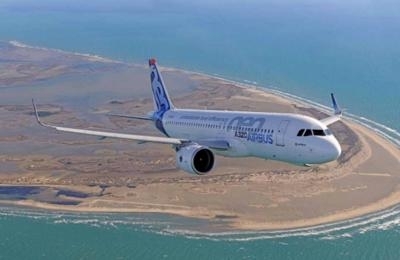 Chinese leasing company CALC has entered into an aircraft purchase agreement for 50 Airbus A320neo aircraft from Airbus S.A.S. (“Airbus”) with an aggregate list price of approximately $5.42 billion. These Airbus A320neo aircraft will be delivered to the Group in stages in 2023. Following this incremental order, CALC’s total order book with Airbus will increase to 202 aircraft, a remarkable achievement underpinned by CALC’s decade-long relationship with the manufacturer. The Group shall purchase 15 additional Airbus A320neo aircraft in January 2018 subject to the fulfillment of certain conditions. Backed by a strong order book, together its expanding fleet with in-demand aircraft sourcing from various channels, including purchase and leaseback and portfolio trading, CALC has expanded its fleet to over 100 aircraft in 2017. The Group is embarking on a new phase of corporate development along with its extended global presence. To support its further expansion, CALC plans to leverage its developed aircraft and client portfolios, its established asset management capability, its expertise in the global aviation value chain and its network of worldwide aviation partners to launch an additional financing platform. The Group has proposed to establish an aircraft investment vehicle (“the Vehicle”) with the mezzanine tranche financiers (the “Mezzanine Financiers”), held at a ratio of 20% to 80% (based on respective aggregate capital commitments, and same for the shareholding), for investing in a portfolio of lease-attached aircraft. The new platform will further extend its asset management capability to optimize its aircraft portfolio with risks diversified, and to capture the growing appetite from institutional investors for aircraft assets with stable and long-term cash flow. This is also part of CALC's wider push to complement its aircraft full value-chain solutions that include services for new aircraft, used aircraft and aircraft coming to the end of their life. The Vehicle will be seeded with an initial portfolio of narrow-body aircraft assets (“Initial Aircraft Portfolio”) with a market appraised value of approximately $826 million. The asset size of the aircraft portfolio is targeted to grow to approximately $1.4 billion in two years’ time from the execution date of debt financing documentation (the “Funding Period”). To facilitate the establishment and to initiate its operations, CALC will inject into the Vehicle a total of 18 aircraft from its fleet. During the Funding Period, the Vehicle may acquire additional aircraft from CALC or from other aircraft vendors, to no more than 25 aircraft. In addition, CALC will also act as the Vehicle's servicer providing aircraft and lease management service by which CALC will have exclusive right to originate any aircraft acquisition opportunities for the Vehicle as long as it serves as the servicer, including any disposal of aircraft to the Vehicle by the Company or any acquisition of aircraft by the Vehicle from third party vendors. The establishment of the Vehicle is subject to shareholders’ approval at an EGM to be held on 18 January 2018.